This is a great recipe to make on a weeknight because it is fairly simple to make and it is also a comfort food. You just feel good eating this because it is hearty, filling, satisfying and it reminds you of when you were a kid! At least it does for me. I ate a lot of eggs when I was a kid. Scrambled, hard boiled, poached, over easy, omelets, frittatas, bird in the nest, fried with bologna, you name it. I loved them then and I love them now. This is a recipe from America's Test Kitchen. I was watching one day and just so happened to have the turkey sausage, red pepper and eggs in the fridge. It was perfect timing. It is an updated version of hearty scrambled eggs for America's Test Kitchen. 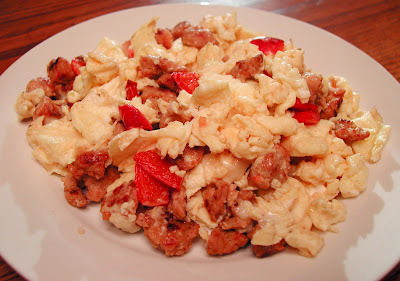 Their goal was to create a scramble that was hearty but not watery. The secret is to pre-cook the sausage and vegetables and to use half and half (which has less water in it and more fat), instead of milk. By pre-cooking the sausage and veggies you drive out the moisture. And by replacing the milk which may cause watery eggs, with half and half you have a perfect hearty egg scramble. It sounded great, but I only had milk in the fridge. They suggested that when adding other ingredients to scrambled eggs, the usual 1/2 cup of milk to 8 eggs (or one tablespoon of milk per egg) should be reduced by half. So I reduced the amount in the recipe as they suggested to one tablespoon to two eggs and they were not watery, they turned out great. Add oil to 12" skillet over medium heat. Add the sausage, breaking up into small pieces, as it cooks for about 2-3 minutes. Add the red pepper and whites of the scallions and cook for about 4 to 5 minutes until softened and sausage is cooked through. Add eggs, half and half, salt and pepper to a large bowl and beat until combined. Remove the sausage mixture from the skillet and let cool on a plate. Wipe out the skillet, add tablespoon of butter and put back on medium heat. Add the eggs to the skillet and gently push them from side to side, creating big fluffy curds, for about 2-3 minutes. When the eggs are almost cooked through, add the sausage and the cheese. Take off the heat and mix slowly. If it is still a little runny, continue to cook for just a bit. Turn onto plates and garnish with sliced scallions. I was thinking that eggs sounded good, today. I ate a lot of eggs, too. Usually fried or scrambled to death. We also used to eat Dutch babies which is the most fattening food in the world. I saw a show last night on Foodtv, and they mixed their eggs for a couple of minutes, using an electric mixer. The eggs turned out really fluffy and delicious-looking. Maybe you or I should try this??? I could try the electric mixer- sounds like a plan to me! It's like a rich pancake baked in a 13x9-inch dish. It has a lot of eggs in it.